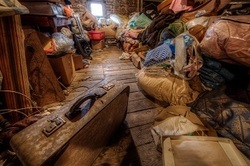 If you have old junk or clutter that is starting to build up in your attic, give us a call. Not only is it unpleasing to the eye, it can also be dangerous to your health. Rodents such as mice, rats, or even bats can begin making shelter right above your head! And don't forget about those pests like spiders and moths that frequently make their homes in middle of old junk. Clear out some space and start with a new, fresh attic and lots of room you didn't even know you had! According to medical studies, long term mold exposure can lead to a variety of upper respiratory problems such as asthma, dyspnea, nosebleeds, and lung infections. Why run the risk of continued exposure to mold? The mold spores that are produced by old junk and clutter can find their way into your air ducts and be spread throughout your house everyday! Air filter systems can only do so much. Don't run the unnecessary risk of exposing yourself or your loved ones to mold. Call us today and get that junk hauled away. Who wants rodents living right above their head? Well, if clutter continues to pile up in your attic that is exactly what is going to happen. Mice, rats, and bats are the most commonly reported rodents that find shelter in people's attic, with mice infestation being the most common. The diseases that are associated with the droppings of these rodents are numerous. And they won't just make their shelter in your attic. Mice, in particular, are known to crawl around in the walls and chew holes wherever they are most likely to find food or water. If you have clutter piling up in your attic call us immediately to avoid this potential disaster from striking your home. Pest are no strangers to those who live with clutter. Spiders and moths can be more than just a nuisance, they can be dangerous. Poisonous spiders such as the Brown Recluse and Black Widow are common to this region of the country, and are known to make their homes in attics and other places where junk has piled up. Moths are known to chew holes through fabric and material. So even you are trying to salvage that old blanket in your attic, these pests can make that less likely to happen. It's an amazing sight to see when an old cluttered attic is cleaned out to look new again. There are so many things you can do with all that space! Do you need room for properly storing useful items? Done. Did you have a do-it-yourself project in mind for the attic space? No problem. The possibilities are endless!